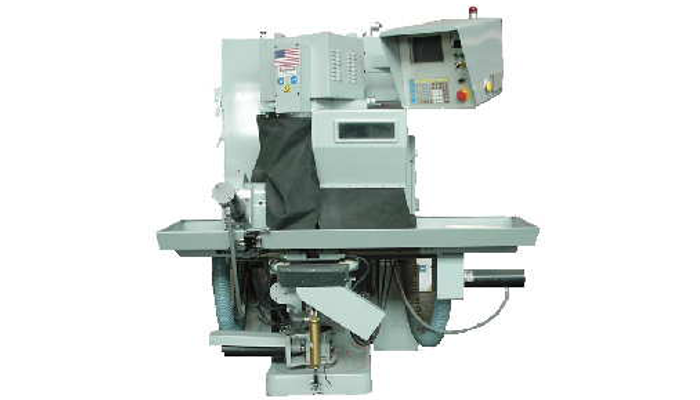 The Model 2650 Combination Cutting Tool/Burr Grinder is a "turn-key" 7 Axis CNC Production Grinder equipped with an automatic pick-n-place parts loader/unloader. Included in the base price is a Variable Speed Spindle, a Tooling Package with a Part Pallet Assembly, self contained coolant system and a complete package of our proprietary software. Unison's Model 2650 features a fully enclosed work area and an automatic steadyrest. 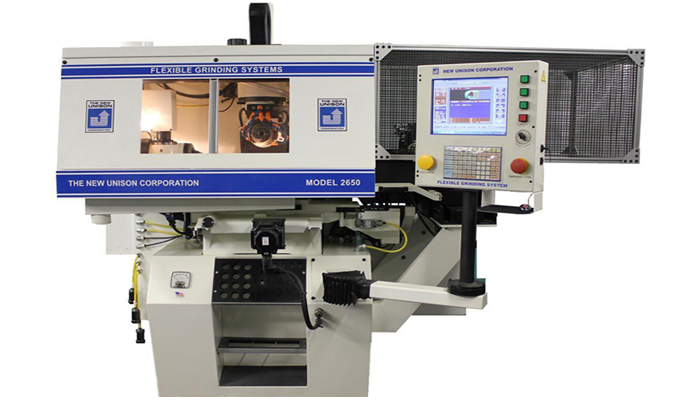 The Model 2650 is a rigid compact, high precision machine designed for high production manufacturing of small tools made from numerous materials such as carbide, HSS,ceramic, stainless steel, etc. This grinder is used by many of the largest manufacturers of dental and surgical burrs. We design our Pentium™ based Computer controls with the Unison Programmable Controller (UPC). The CRT and pushbutton station with keypad is swivel-mounted and conveniently located at the work level. The computer has the ability to store up to 10,000 different part programs and wheel packs which can be easily recalled by the operator. Unison's Version 7 Software coupled with Windows 7™ supports the most advanced touch screen capabilities permitting Unison to now offer an optional 15-inch touch screen LCD computer monitor on all of its CNC grinders. The Windows 7™ Operating System works seamlessly with Unison proprietary Version 7 Grinding Software which includes a unique "AUTO OPTIMIZE" feature designed specifically for reducing part cycle time without having to modify your existing tool programs. Unison's new software also allows the machine operator to quickly customize and/or modify tool geometry using a real-time 3D Parts Generator as well as provides a dual feedback diagnostic system for troubleshooting machine errors. The flexibility of this machine's software allows for the most complex parts to be ground with ease. You are not "locked-in" to what the manufacturer of your equipment thinks tools should look like. In as little as four steps, tools can be defined, simulated and ground. Your operator can view those tools on the machine's touch screen monitor before any grinding begins. The operator knows exactly what the machine will be doing before it does it. We call this feature "Geometral". The Model 2650 can be equipped with an optional Probe Assembly which is designed to be used with tools which have from one to ten flutes and can be utilized with endmills, drills, reamers and routers. The Probe Assembly locates the end of the tools, identifies flute position and verifies helix. 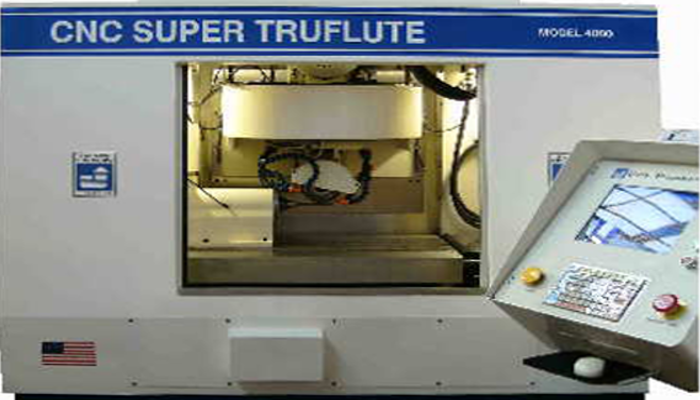 The Model 4000 Super TruFlute is the ultimate for fast, accurate cutting tool production. 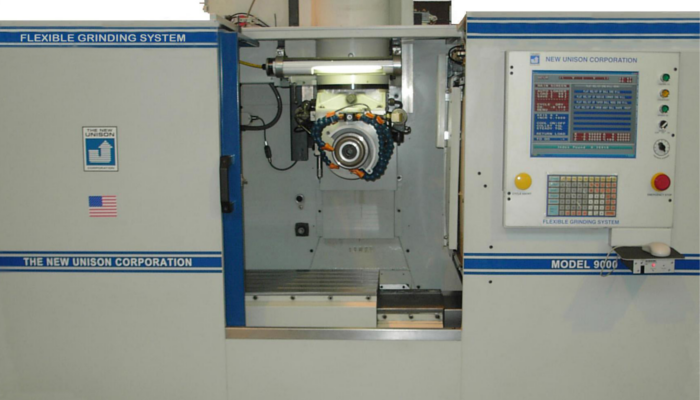 This machine consists of 5-Axis having the most state-of-the-art controls. The Model 4000 incorporates state-of-the-art technology in the machine's design. 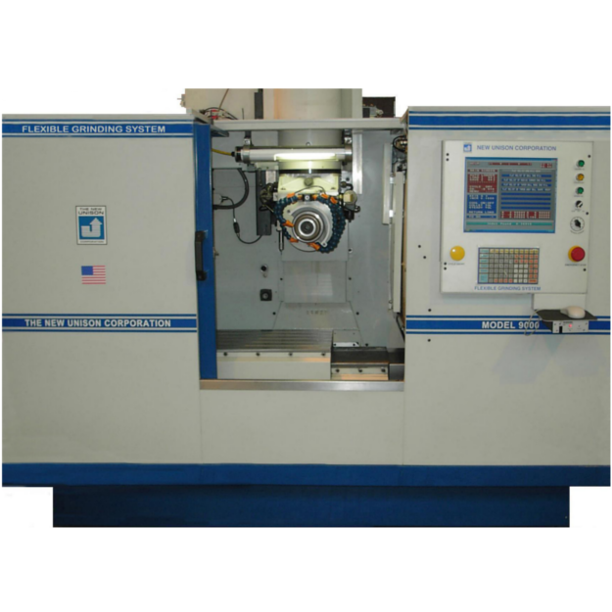 The machine utilizes a system of round hydrostatic ways on the X, Y & Z axes and a substantial C-axis assembly which minimizes machine deflection during the grind cycle.The hydrostatic components increase the machine's accuracy, rigidity and overall grinding speed. These special ways use an oil film under pressure between moving parts to minimize friction, increased damping, stiffness and mathematical accuracy. The Model 4000 features Unison's proprietary software for program calculations and machine motion control. The machine's software employs a fill-in-the-blank system to easily define the dimensional data required for setting up cutting tools. 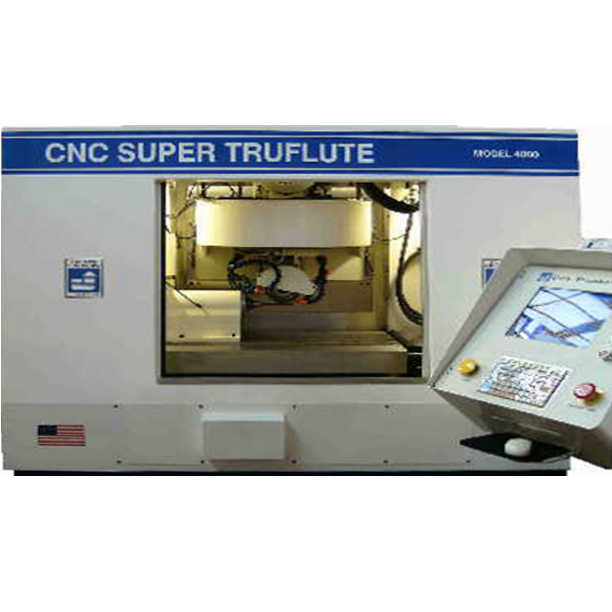 Our software is known as "Geometral™" which allows your operator to quickly modify and customize your tool geometry making the Model 4000 Super TruFlute one of the most powerful and flexible machines on the market. You are no longer required to make tools the way the machine manufacturer dictates, but rather you design your own tools the way you want them. This machine was designed to regrind pulverizer blades in your factory thereby eliminating the costly expense of shipping them to a third party regrind facility. In addition, you can minimize the number of blades you maintain as spares since the blades can be quickly reground in-house for a fraction of the cost. 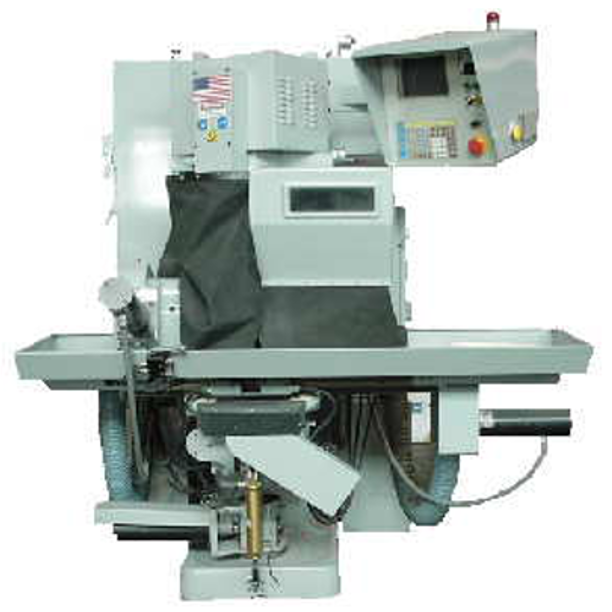 The Model 9100 Pulverizer Blade Regrinder is a 5-Axis turnkey grinder featuring an integrates 25 horsepower, direct drive, dual ended spindle. The direct drive spindle motor provides a continuous torque rating through its entire operating range. The Model 9100 incorporates our latest tool grinding software utilizing Windows™ Operating System. The flexibility of our software allows your machine operators to customize grinding programs to meet your needs. Our Geometral™ software permits the operator an easy means of quickly modifying geometry making the Model 9100 one of the most powerful and flexible machines on the market today. The Model 9100 regrind's Pulverizer Blades in your factory thereby eliminating the costly expense of shipping them to a third party regrind facility. In addition, you can minimize the number of blades you maintain as spares since the blades can be quickly reground in-house for a fraction of the cost. For more information on how the Model 9100 can help your company become more efficient and cost effective, please click the link and read the article in the April 2009 issue of Cutting Tool Engineering Magazine. Model 688 4-Axis CNC TruFlute Helical Grinding System produces straight or helical flutes in one pass. This machine automatically grinds straight and tapered fluted tools such as drills, reamers, end mills, etc. 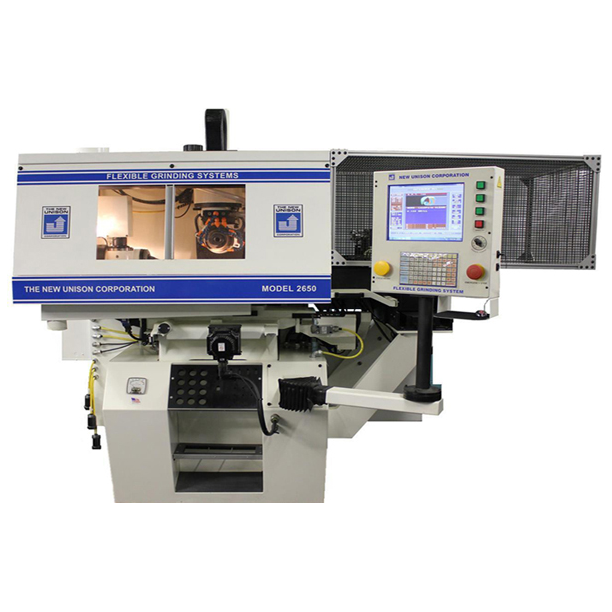 Known as a "Workhorse", the Model 688 is a rigid and proven helical grinding system designed for the manufacturer of both standard and special tools. The Model 688 Four Axis CNC TruFlute Helical Grinding System produces straight or helical flutes in one pass and automatically grinds straight and tapered fluted tools such as drills, reamers and end mills. The Model 688 is a rigid and proven grinder designed for the manufacturer of both standard and special tools. It is furnished with a curtain enclosed work area, splash guards and a access door for loading and unloading the workpiece. The Model 688 is known as a "Workhorse". OD size range .01" to 10.00"